Neil Martin was among the first players to score 100 league goals in both Scotland and England and won three full international caps for Scotland. Known for his strength, power, bravery and commitment, Martin scored consistently in a ’have boots, wil travel’ career. He played for Alloa Athletic, Queen of the South, Hibernian, Sunderland, Coventry City, Nottingham Forest, Brighton & Hove Albion, Crystal Palace, San Antonio Thunder and St Patrick’s Athletic. Neil Martin (born in 1940 in Tranent) decided to begin his senior football career at Alloa Athletic despite interest from Rangers. In 1960-61 he scored 25 league and cup goals. This helped take Alloa to the quarter finals, as far as they have ever been on a Scottish Cup run. At that stage a Dunfermline Athletic side knocked them out at the beginning of the Pars’ golden decade; Jock Stein would manage Dunfermline to victory in that season’s Scottish Cup and to the next season’s last eight of the European Cup Winners Cup. Martin’s feats attracted suitors and at the end of the season he was on his way South. "Neil was a big gem. It didn’t matter what you did to him, he never got involved. He got kicked stupid but still, he picked himself up and got on with the game and scored goals. I remember him saying to me, ‘That’s the best thing you can do, that’s the best reply of the lot, stick the ball in the net and they can’t do anything about it’." Fast and tricky right-winger Hannigan formed an outstanding partnership with Martin (Hannigan said after hanging up his boots, "Going to Queen of the South turned out to be a great move"). In 1961/62 Queens were promoted back to the top division as Division 2 runners up. Martin was on the score sheet 30 times in league and cup. In Martin’s second season at Palmerston Park, Queens retained their top-flight status. Queens also enjoyed another decent cup run making it to the Scottish Cup quarter finals. In the last 16 Queens played Willie Waddell managed Kilmarnock, that season’s Scottish Championship runners up and title winners two seasons later. George Farm had an outstanding game at Rugby Park but was taken off with fourteen minutes to go. It was Martin who took over in the nets to earn a 0-0 draw before Queens won the Palmerston replay 1-0. In the last eight Martin scored the equaliser in the 1-1 away against Dundee United. The second game also finished 1-1 with Hannigan crossing for Anderson this time to score Queens’ leveller. However as has been the case so often before and since, the quarter finals proved to be the ceiling on Queens’ Scottish Cup ambitions for the season. At neutral Ibrox they lost the second replay conceding all four goals of the game in the second half. In 1963 Hibs, trying to battle through a trough in their fortunes, paid £7,500 for Neil Martin to play for the team he had supported as a boy. Martin’s goals helped add impetus to the club. In 1964 the manager joined who Martin later said was the best he played under, Jock Stein- the Hibs up-turn was instantaneous. Martin scored 29 league and cup goals. Hibs finished 4th in the 1964-65 league season (interestingly ahead of both halves of the Old Firm) and knocked out Rangers on the way to the Scottish Cup semi finals. Again Dunfermline (now with Alex Ferguson on the playing staff) proved to be Martin’s nemesis in this competition. The Pars had also knocked Queens out that season. Hibs played Real Madrid in a challenge match at Easter Road and handed their guests a 2-0 defeat. Martin provided the cross from the left volleyed home by Peter Cormack for the second goal. Mercilessly, against ex club Alloa, he scored 4 in an 11-2 League Cup thrashing. He also hit 4 in a top division game against his other ex-side, Queen of the South. Martin was at Hibs in their Fairs Cup 1st round exit to Valencia. Hibs won at home 2-0 but a defeat by the same margin in Spain meant a play off. Hibs lost 3-0. Martin played for Scotland at U-23 level and 2 games for the Scottish League in which both ended 2-2. Martin scored along with Joe McBride at Roker Park in the 2-2 draw against the English League. Speedy strike force Johnny Byrne and Jimmy Greaves scored for the English. McBride hit both Scottish goals against the League of Ireland. At the end of the 1964-65 season Scotland played two away World Cup qualifiers. Martin made his debut partnering a scoring Denis Law in a 1-1 draw in Poland, and was paired with Law again in a 2-1 victory in Finland. This time the goals were scored by John Greig and future Queens manager, Davie Wilson. Martin won his third and yet again unbeaten final cap after his move to Sunderland (all three caps were awarded in 1965). Martin partnered Alan Gilzean in the 1-0 victory over Italy at Hampden Park with a late winner from John Greig. This is Scotland’s only ever full international win against Italy. Played in front of 100,000 fans, Martin when retired said this was the highlight of his career. £45,000 was the latest transfer fee for the fearless forward. On his debut on 23rd October 1965, Martin scored away at Sheffield Wednesday. Seven weeks later he scored two against Best, Law & Charlton of Manchester United but still lost 3-2. Lining up beside him among his new team mates was Jim Baxter who even though he didn’t show his best form for the Roker men, Martin later still said was his favourite player there and described him as, “A class act”. Another team mate was the long serving George Herd, later manager of Queen of the South. Sunderland retained top tier status in Neil Martin’s time at the club. However Sunderland were unable to team him up with the right kind of strike partner, thus his potential effect was reduced. Nick Sharkey was possibly his best partner at Roker Park but left early in season 1966-67. Sharkey’s replacement was John O’Hare; committed, yes; prolific, no. Martin was never paired there with the nippy sort of goal grabber who could feed off a strapping centre forward. So Martin remained primary goal scorer - in his only full season at Roker (1966/67) he hit 20 league goals and six in the FA cup. In 1967 Martin was involved in a fifth round FA Cup tie that now has some infamy, being a game with alleged referee bribing by Leeds manager Don Revie. After two 1-1 draws (with Martin scoring in the first game) a second replay went ahead at Boothferry Park in Hull. With the score at 1-1 yet again and the clock ticking down, the Leeds bench are alleged to have given orders for their next player near the Sunderland penalty area to take a dive. Jimmy Greenhoff elaborately went over hitting the deck close to the edge of the box. Whistle, penalty, goal – Leeds through, Sunderland out. In 99 first team games for Sunderland Neil Martin scored 46 goals in league and cup. His goals included strikes against (among others) Chelsea (2), Everton (3), Leeds (2), Liverpool (3), Man U (2), Newcastle (1) and Spurs (1). Martin’s last appearance on a Sunderland team sheet was again away to Sheff Wed, on 3rd February 1968. This was the only time he was named as a substitute in his Sunderland career (he didn’t make it on to the pitch that day). Martin was then on the move again. Coventry splashed £90,000 for the battling Scot during a relegation scrap. He was re-united with Ernie Hannigan from their successful partnership at Queens and among others, in midfield was Ian Gibson from Newton Stewart. Martin replaced Bobby Gould and by the season’s end had equalled Gould as joint top goal getter for the season with eight. Coventry survived their first ever season of top-flight football. 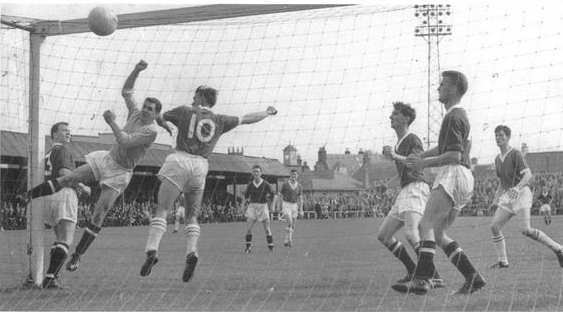 A couple of mobile, smaller strikers benefited from their partnership with Martin, namely Ernie Hunt and John O’Rourke. After another relegation battle in 1968-69 things improved significantly the season after. Martin finished as the Sky Blues’ player of the year and top scorer (15 goals) as Coventry achieved their highest ever league finish - 6th in England’s top tier in 1969/70. 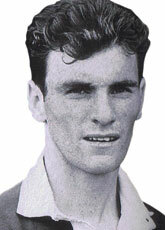 A young defender began to emerge at Coventry who would later play for Queen of the South - Bobby Parker. With the 6th place finish came the prize of a place in a UEFA organised tournament, the 1970/71 Inter Cities Fairs Cup, as the UEFA Cup was then called. This is Coventry’s only ever qualification for a UEFA organised tournament. The first round brought a tie against experienced European campaigners from Bulgaria, Trakia Plovdiv. Trakia captain, Dinko Dermendzhiev, had been selected for three successive World Cup squads and later admitted he could see no reason not to feel confident against the unknowns from Coventry. However O’Rourke scored a hat trick and Martin notched one himself as the Bulgars were beaten 4-1 in Plovdiv. Martin sat out the second leg 2-0 home win. In the second round against Bayern Munich (first round conquerors against Rangers), Coventry’s keeper was injured the Saturday before the away 1st leg. Pitched in to play against Franz Beckenbauer, Gerd Müller and Sepp Maier was the young and inexperienced reserve goallie, Eric McManus. 4-1 up after 17 minutes in torrential rain, the Bavarians added two more to finish 6-1 winners. To young McManus’ credit he recovered well to build himself a long career as player and coach. In the home leg Martin & O’Rourke again shared the score sheet joined on this occasion by a solitary Bayern goal coming from Uli Hoeness; creditable enough for Martin’s side but scant consolation for the first leg hammering. In between the UEFA Cup ties was a home game against Everton featuring what is probably the best known goal in Coventry history. Willie Carr straddled the ball with his heels in a free kick position 20 yards out. In a single movement he flicked the ball up for Hunt to crack home the volley. Coventry won the game 3-1 with Martin adding to a double score by Hunt. Carr’s improvisation in what has become known as the ‘donkey kick’ was rewarded by the football authorities by being outlawed at the season’s end. Martin was then on his way mid-season again. He joined Forest on 18th February 1971 for a few of £66 000. Although Martin only contributed one goal in what was left of season 1970/71, the club stayed up, benefiting from the Scot’s highly experienced presence. With injuries starting to niggle Martin, Forest were relegated at the end of season 1971-72. Martin’s days of top flight football were over. 1972-73 season was a disappointment, with Forest never threatening a promotion challenge and Martin picking up an injury pre-season against Kaiserslautern - he missed three months. Martin hit the net on his come back in a 2-1 victory at Sheffield Wednesday but the season was undistinguished. Under former Scotland internationalist Allan Brown (ex team mate of Bobby Black at East Fife and George Farm at Blackpool), the next season saw some improvement. Martin kept away from injury and provided the brawn for Duncan McKenzie who hit 26 goals as the division’s top scorer that season. In the FA Cup Martin scored twice in sweeping aside Bristol Rovers in the third round. Martin then played his part when Manchester City were on the end of a tremendous 4-1 thumping. After seeing off Portsmouth, Forest were away to Newcastle United in the quarters. Forest were looking good as they went 3-1 up against a 10 man Newcastle. Newcastle fans invaded the pitch. After the restart the roof fell in on Forest - they lost 4-3. The FA declared a replay at neutral Goodison Park. After a no score draw Newcastle went through 1-0 when they replayed at Goodison again. In 1974-75, in good form, Martin scored twice, punishing Sheffield Wednesday this time in a 3-2 victory in late September. And so he joined Joe Baker as a player to score 100 league goals in both Scotland and England (Football England and at least one other source claimed Martin to be the first to do so but this appears inaccurate). In scoring the 1-0 winner in the FA Cup 3rd round replay at Tottenham Hotspur, in the first game at the club of new manager Brian Clough, Martin claimed the distinction of scoring the first goal of Clough’s reign at Forest. Many of Martin’s Forest team mates would go on to enjoy success beyond the bounds of their imagination under the midas touch of Clough and his assistant, Peter Taylor. For example, John Robertson, Martin O’Neill, Viv Anderson, Tony Woodcock and Ian Bowyer were future European Cup winners at Forest. Like Martin they were already at Forest when Clough arrived. However at 34 years old, Martin did not have age on his side. Martin next joined third division Brighton, scoring a debut goal against Rotherham United. He scored two more at Sheffield Wednesday (yet again) this time in a draw. Despite things seeming to go well at the Seagulls, Brighton signed Sammy Morgan signalling the manager had other plans. In March Martin left one promotion chase for another, signing for Crystal Palace, but only scored once for the Eagles when drawing with Halifax Town. The Palace promotion challenge petered out (Brighton also lost out). In 1976 Neil Martin moved to the USA where he played 19 games in the North American Soccer League scoring five goals. Many of his team mates were fellow ageing pros from the UK game - Booby Moore and Bob McNab from England and Scotsmen, Bobby Clark. Tommy Callaghan, Jim Forrest and someone a couple of years later to join QoS, Harry Hood. Martin then ended his playing days playing with St Patrick’s Athletic in the Republic of Ireland. After hanging up his boots Martin went into coaching with Dave Mackay for ten years in Kuwait & Dubai he described as, “great”. He had a spell as joint manager of Walsall with Alan Buckley. He ran two pubs in Birmingham before retiring back to Tranent and visiting family in Birmingham. In March 2007 Martin attended the Queen of the South v Hibs Scottish Cup quarter final at Palmerston Park. He attends Hibs matches at home with ex-team mate, Peter Cormack.